Ashbee Design: Yikes! 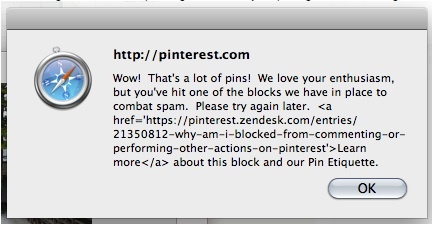 Blocked by Pinterest! Why? How? What? Wow! That's a lot of Pins????????? "If you’re seeing a continued error message when you try to comment, pin, repin/like a pin, or follow another Pinner on Pinterest, it’s likely because you’re being blocked by our automated spam detection system. 5. Using a link-shortener or a link-redirect, for example: bit.ly or other link-shorteners - try using the full link in a comment or pin description instead! Also try pinning from the original source without using a link-redirect." I have done none of these things. In fact, I have been on vacation for a week, and although I did some pinning, I didn't do anywhere near my normal volume. The site provides a method for submitting a request for review. I have followed the directions, received an automated reply with a repeat of the same directions, followed them again and am now waiting. Has anyone else had this problem? Solutions? Ideas? It took about 14 hours but this afternoon my Pinterest account started working agin. I did follow the "Submit a request" procedure. I received an automated reply requesting me to do it again, and then I waited. I did try to locate a help line, or a phone number. One place did list help@pinterest.com as a help line but my email was rejected. Bottom line: I am pinning again- but don't know what caused me to be knocked off. Oh my gosh- I can't imagine not being able to pin! I've not heard about this, but I hope you'll provide an update when you get some resolution. There's no live link for chatting with a real person? I had the same message one day a couple weeks ago. Then it worked again in a couple of days!! Weird! Perhaps the item you were trying to Pin was linked to a Spam. Something on your Pin triggered the alarm and was blocked. So, it was probably a good thing that it got blocked. I'm just glad to know that you get "Unblocked" in a couple of days - So in case this happens to me - I'll not panic. I have gotten those as well. Pinterest says you should expect that about once a day. This was more intense. I wasn't allowed to pin at all - no captcha to enter. Just shut off. Back on after 14 hours though. i haven't been blocked, but i had to fill in the code (which you can barely decipher) before i could continue. of coarse it had to refresh about 4 times. i wasn't doing anything spammy either!